But there’s also the sense that many organizations aren’t sure how to harness all the power that social media has to offer when it comes to their target customers. According to research from Demand Metric, only 30% of respondents in a survey of B2B marketers said social media had met or exceeded their ROI expectations for driving brand awareness, and only about a quarter of them said it was meeting their hopes when it came to lead generation. The reason for this disconnect between the popularity of B2B and the reality of its performance: too many organizations aren’t putting forth an integrated effort that is goal-oriented, strategic and dynamic. In our view, the key to social media success is using the platforms to amplify brand stories, validate that buyers are buying the brand’s products for the right reasons, and help brands to attract and maintain interest from a variety of stakeholders in addition to customers, such as vendors, employees and shareholders. When we work with clients on their social media strategy, we help brands use social to engage with people in the way they want to be engaged today. This means telling a comprehensive and compelling brand or product story across all channels and platforms. Doing this requires a bit of legwork: We review the competitive landscape, including the good, the bad, and the ugly, across various platforms and from the biggest competitors, and then compare to see how a brand rates against competitors. Social media implementations also need to go beyond general awareness messaging to provide integrated, strategic and engaging content. Doing this on a continuous basis can be overwhelming. That’s why we work to streamline processes for our clients. This means looking across all platforms and channels to find ways to make them more unified and easier to maintain. Sharing compelling, engaging content with the right audiences at the right times always one of our goals for clients. We work to humanize B2B brands to differentiate them from their competitors and deepen the connection between them and their customers. But it’s not only about organic content: The ideal social strategies use a balance of paid and organic content. This provides a strategic approach to the effective and efficient allocation of a brand’s social media budget. Another big part of social media that many organizations forget about is social listening: monitoring those conversations that are taking place within social media and being a part of them, and seeing how they add to or detract from the brand story. So when we work with clients on social media execution, we listen to what key audience segments are saying about the brand and its competitors, and help determine how that conversation needs to continue. Having a successful social media presence in the B2B sector takes a unified, integrated plan in order to drive results and earn the ROI that B2B executives expect. We believe there are a number of components that will make this happen. The goal in most cases for B2B brands is using social media as a way to drive conversions. But this will only happen if there is engagement. And one way brands can be sure they are engaging the right audiences is by developing a unified strategy across all of their channels and platforms. Social media management also revolves around executing, testing and optimizing. The only way for brands to be completely confident about what engages their target audiences is to test various types of executions across different social media platforms, to see what works and what doesn’t. Another important component of our social media strategies: Analyzing the results in a way that leads to actionable insights. Meaningful social media results should continue to drive and inform social media strategy. 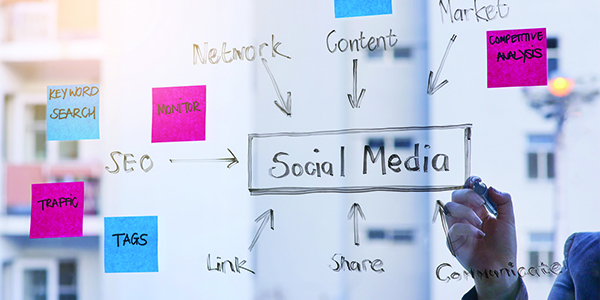 A few of the specific plans that we offer our clients when it comes to social media are resource or tooling to benchmark their current activities, and then insights on how to go forward with an integrated approach. In many cases for example, we may start by conducting a social audit to analyze current social efforts in the context of the industry’s social universe and identify strengths and opportunities. The next steps are to create a high-level social media roadmap, and then developing more structured social media content calendars. Obviously social media is just one marketing component that we focus on for our clients. In the next blog we’ll analyze another key tactic: search engine optimization. If you’d like to hear more about developing a unified social media strategy, please reach out to us for a conversation.